CYGNSS was launched into low Earth orbit on December 15, 2016 at 08:37 EST and today is its first anniversary. The mission has had a very busy first year on orbit, transitioning from an early engineering commissioning phase into the science observing phase in time for the very active 2017 Atlantic hurricane season. The mission was supported during the hurricane season by the NOAA Airborne Operations Center (AOC), which operates a fleet of P-3 “hurricane hunter” airplanes that make reconnaissance flights into tropical storms and hurricanes to observe wind speed and other weather conditions first hand. We worked closely with AOC to coordinate many of their flight campaigns with overpasses of the storms by CYGNSS. 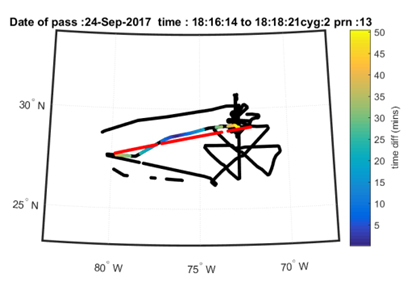 They were able to time many of their eyewall penetrations to align closely in both time and space with our overpasses, which helps us train and evaluate our own wind speed measurements As a result, we now have dozens of coincident tracks of wind speed observations through the inner core regions of Hurricanes Harvey, Irma, Jose and Maria. The collaboration with NOAA this summer and fall has been incredibly fruitful, and I and the CYGNSS project team are very grateful for their generous support. As the 2017 hurricane season winded down, we turned our attention to processing the coincident overpass data and characterizing and evaluating the performance of our wind speed measurements. One example is shown here. On September 24, 2017 at 18:13-18:21 UTC, the CYGNSS FM#2 spacecraft flew across Hurricane Maria. The red line in the figure shows the track of the specular reflection from transmissions by the GPS PRN#13 satellite. CYGNSS makes its wind measurements along this track. The black line in the figure shows the flight path of the P-3 hurricane hunter that day. A distinctive cloverleaf pattern can be seen that results from the plane making multiple eyewall penetrations. The colored portion of the P-3 flight path is the leg closest in time and space to the CYGNSS specular point track. The color scale represents the difference in time between the CYGNSS overpass and the P-3 observing time. With such close coincidence in time and space, we hope and expect that the two measurements of wind speed will be consistent. 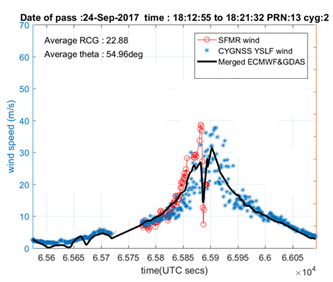 The next figure shows the wind speed measured by CYGNSS (blue), measured by the P-3 airplane using its Stepped Frequency Microwave Radiometer (SFMR) wind speed sensor (red), and produced by the ECMWF and GDAS numerical weather prediction (NWP) models (black) along the CYGNSS specular point track. Away from the storm center at lower wind speeds, CYGNSS and NWP measurements agree well. Near the storm center, CYGNSS responds to the much higher wind speeds. In general, NWP models tend to underestimate peak winds in large storms and this is likely the case here. While NWP models generate winds everywhere, SFMR winds are only available along the portion of the satellite track where the P-3 airplane flew. In the region where coincident measurements were made, CYGNSS and SFMR winds can be seen to agree fairly well. It should be noted that the scatter present in the CYGNSS measurements can be seen to increase as the wind speed increases. This is probably a result of the decrease in GPS signal strength scattered in the specular direction when the sea surface is significantly roughened by high winds. How best to handle this characteristic of the CYGNSS wind speed retrievals will be an important topic of upcoming investigations. and selecting the ‘Data Access’ tab to reach an FTP link to the data files. This entry was posted on Friday, December 15th, 2017 at 12:12 am and is filed under Cyclone Global Navigation Satellite System (CYGNSS). You can follow any responses to this entry through the RSS 2.0 feed. Both comments and pings are currently closed.